This entry was posted in elements, hops and tagged books, first wort hopping, Hallertau mittelfrüh, techniques by MD. Bookmark the permalink. Doing a smash with maris otter and cascade the weekend. Sounds like a perfect option. That looks tasty, Dawson. I’ve really got to try FWH myself, and see if I can track down these “Rounded” hop elements. “Alchemy.” Yes, but does it have to be, completely? Hieronymous closes that book with, and I’m paraphrasing, the hop may be cordial, but it’s still poorly understood. Armed with an HPLC/GC-MS, some chemical intuition and a working knowledge of sensory science, a brewer, if so inclined, could partially unravel the finer details of aroma, better define the relationship between glycosides and flavor, perhaps even look at the synergism between the various chemical components of hops and why neither constituent alone can produce the same sensation as they do together. My theory, and it’s only a theory, is that the myriad of chemical reactions occurring in the mash tun, the kettle, and the fermentor between all >400 known compounds in hops and the dog’s dinner that makes up the biochemical milleu of a typical wort is SO complex that it makes Maillard reaction chemistry look like child’s play. Regardless, Hieronymous’ book is both tremendously fascinating and uniquely frustrating. “Fascinating and frustrating” is apt. It’s a very journalistic survey of hop history and culture with lots of documented brewery practices that are successful and conflicting – the chapter on dry hopping is a nice case in point. Certainly no one right way to skin a cat! Some major brewery needs to throw a wheelbarrow full of money at you, DK. I tried to FWH in my last brew. It was supposed to be an English IPA, but ended up as more of a pale ale. There was no bitterness from the bittering hops. I always fwh my American beers where hop flavor is a key component…I need to read this book still… Pre ordered it but have not had chance to look at it. Just brewed my first 10 gallon pho-lager thanks to Brewing T.V OG 1.058 Vienna style. San diego super strain for half and scottish ale yeast for the other. Both fermenting @ 52 degrees. Thanks again MZA. CHEERS! Also FWH with Herrsbrucker. After watching a great many of the of the videos you have entertained/educated the world with, I was hoping you could indulge me with an answer to a question. The kettles you use on you Top Tier system really seem to be the perfect combination of size and functionality. My guess is that you are using one 15 or 20 gallon Megapot as your boil kettle and 1 (or 2) 15 gallon kettles as your mash tun and HLT. Assuming my guesses are anything close to reality, could I ask you to divulge where you bought your kettles and how you have them setup (ie if you are using a false bottom.) Thank you in advance. They are Polarware kettles – 10 gal HLT and MLT, 15 gal boiler, with false bottoms in the MLT and boiler. 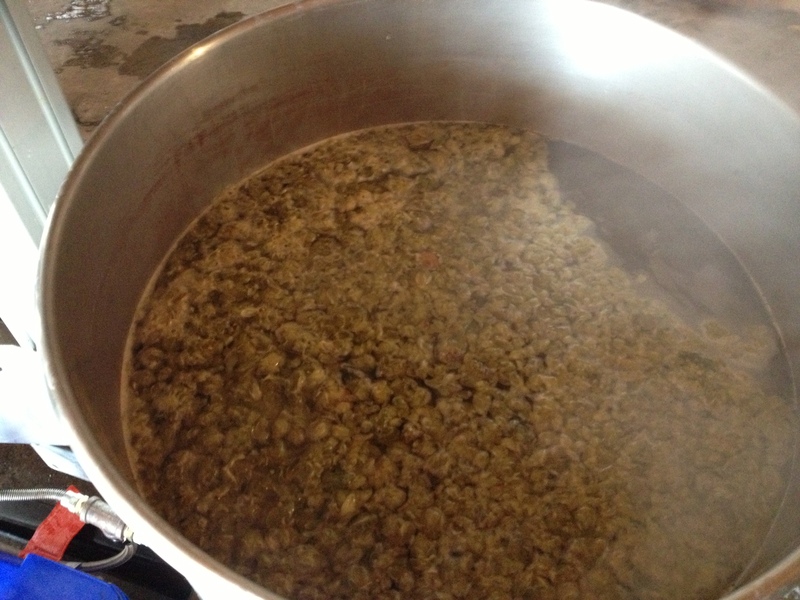 Reviving an old thread… I should probably have put this in your “I’ll Show You Mine” post but do you have any issues with Pellet Hops clogging your False Bottom? I just got a new boiler (15 gallon with ball valve) and have been researching exactly how I’m going to get that wort out of there without all the hops and break material getting into the Fermenter. Any help MD? As most of the posters mentioned… Thanks for all the content you provide via your blog and videos. I use mostly or all whole hops, but the clogging I’m trying to avoid is downstream in my plate chiller; I haven’t had issues with my FB (Polarware) getting clogged from pellet hops (although I suppose a heavy enough load could jam up the ball valve). I’ve had issues with whole and/or pellet hops clogging up the false bottom. If you get a good whirlpool going then it makes it less likely that the FB will get clogged. I keep a sanitized spoon available to scrape the hops out of the way should I run into issues. I’m a big proponent of FWH and that book. I fondly refer to it as my “Green Machine Bible”. The hop reference in there is pretty invaluable. A lot of fantastic and interesting information!